A dental implant is composed of three key components: a small titanium screw that is inserted into, and fuses with, the jawbone, an "abutment" or post which attaches to the implant, and a crown (in the case of one implant) that fits over the abutment to provide a natural looking tooth that functions well. Dental implants may be used to replace individual teeth, multiple teeth, or all your teeth in one or both arches. 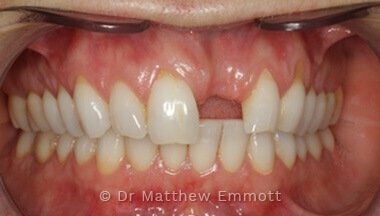 In the case of a full arch, 14 teeth may be supported by as few as four implants. 3. How successful are dental implants? Dental implants successfully integrate with the bone in more than 97% of the cases. In those few cases where an implant becomes loose, your implant surgeon will remove the implant and allow you to heal before placing a new one. 4. 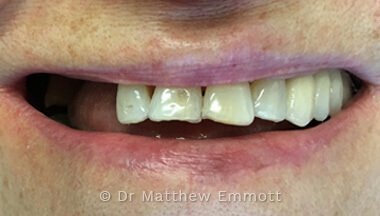 Can anyone get dental implants? Almost everyone that has lost a tooth, several teeth or even all of their teeth is a candidate for dental implants. There are very few situations in which implants are not indicated. In fact, the dental profession is undergoing a great paradigm shift in that regular restorative dental crowns, bridges, partial and full dentures are starting to be considered obsolete, to be used only as alternatives to the effective treatment of dental implant supported restorative dentistry. 5. What is involved in getting dental implants? Traditional dental implant treatment involves an examination and assessment by your implant surgeon, who will then consider all the possible options. He will then discuss the different options available. The implant or implants will be placed. Three to six months will be allowed for healing. The new teeth will then be constructed and fitted. The whole process will take between three and nine months. 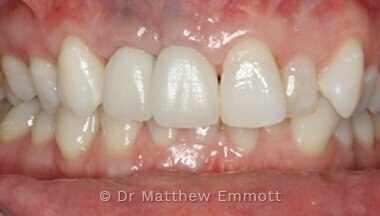 There are also many instances when teeth can be fitted on the same day as placing the implants. 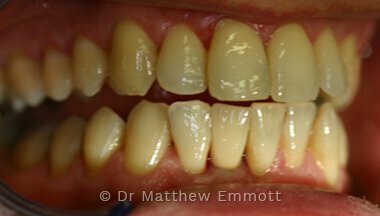 In certain circumstances it may be possible to place the implants and new teeth on the same days as teeth are extracted. 6. How painful is the dental implant procedure? This procedure, as any other oral surgical procedure, has some associated discomfort. However, many implant patients comment that they were surprised at how minimal the pain and discomfort of their procedure were, especially with sedation. 7. Who places dental implants? Where do I go for my treatment? 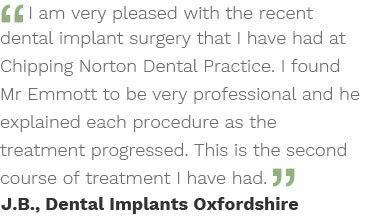 Dental implants may be placed by a dentist who has received appropriate training and has been assessed as competent to place dental implants. Your implant surgeon should have attended a recognized post graduate training course such as the Faculty of General Dental Practitioners at the Royal College of Surgeons Diploma in Implant Dentistry. 8. 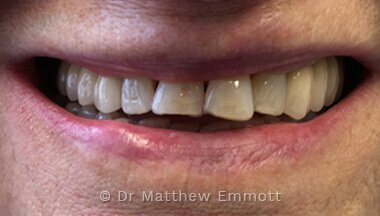 How do I care for my dental implants and new teeth? 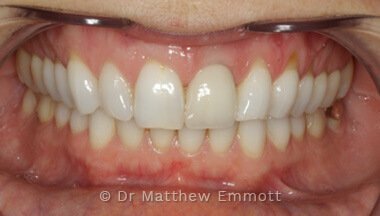 Implant supported teeth need to be brushed and cared for just like natural teeth, particular attention should be paid to cleaning in between the teeth and implants . As with natural teeth, you will need to visit your dentist and hygienist regularly. 9. Am I too old to have implants? The only thing to stand in the way of dental implant treatment in the elderly is general medical health. There are a number of medical conditions that can preclude treatment. 10.I have some of my own teeth. Can I still have implants? 11. Can implants always be used to replace missing teeth? 12. Are implants safe and how long will they last? 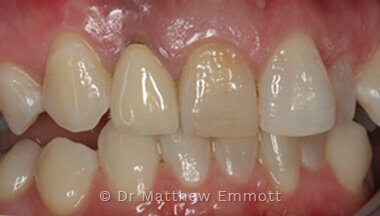 If you don't look after your implants they will develop a coating similar to that found on neglected natural teeth. 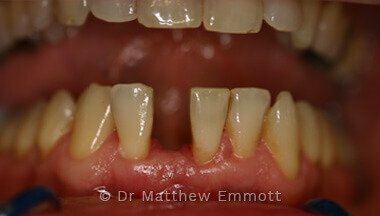 Left untreated, this can lead to peri-implantitis and the loss of the implant.